In Northfield, Massachusetts, near Greenfield, 142 acres of farmland, forest, streams and ponds will soon be permanently protected from development, David Kotker told the Valley Post on May 19. He works for the group that is fighting to save the land. The group has a web site at www.MountGrace.org. A trail designed for people in wheel-chairs and for people walking will be open to the public. More than $330,000 to save the land and build trails came from the state and town government, and donations. When another $10,000 is raised, the deal will be done, Kotker said. The vast majority of land in the Valley is not protected from development. New homes can be built in existing downtowns like Greenfield and Springfield by converting rundown single family homes to energy efficient multi-family housing. In downtown Brattleboro, the supermarket-sized food co-op recently added two stories of apartments upstairs from the store. On the first map, a star shows the location of the Northfield land. 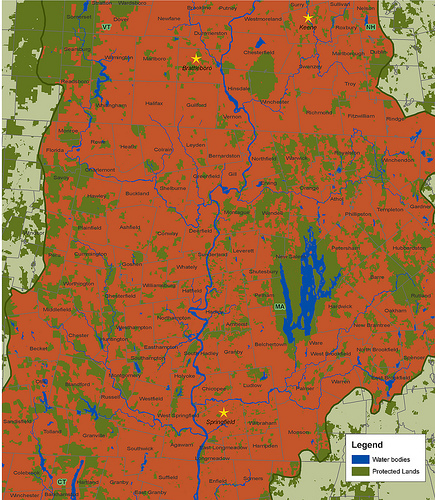 To enlarge the map, click on it, then scroll down and click "see full size image." map by mountgrace.org. 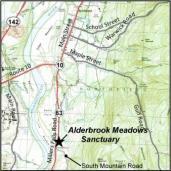 The second map was made by the Trust for Public Land in 2006. It shows the Pioneer Valley section of the Connecticut River watershed. Land outside the watershed is light green, meaning streams in that area do not flow to the Connecticut River. Dark green land has been protected from development. Red land is vulnerable to being paved with McMansions, Wal-Marts, parking lots, roads, and ChemLawns. Click on the map to enlarge.